Extremely professional and warm welcome, very clean and comfortable studio with a fabulous bedding, great shower and well equipped kitchen. Great position in the heart of the city.. we couldn't have asked for more! Spacious room, very clean, brand new apartment. Great bed and shower! Top location in the middle of Glasgow, just around the corner of the biggest shopping street. You can park the car in a car park nearby and get a discount from the hotel. It was my birthday during my stay and the staff had gave me a card and a gift which I was really happy with and staff were so nice and very helpful. We ate at Atlantic, that was fantastic, also the apartment was so comfortable, clean and safe. Extremely central and staff were very helpful. Good central location. Room clean and well equipped. Great finish and style of the room. Great location and staff. The location was fantastic, right in the middle of everything. The room was spacious with a very comfortable bed and sofa. The kitchen was also a good size and well stocked. This apartment room was fab, it had everything you could need. The bed was super comfy and it was in the perfect location! You must stay here on your trip to Glasgow!! Lock in a great price for Native Glasgow - rated 9.6 by recent guests. Found in an Edwardian building formerly home to the Anchor Line Shipping Company’s headquarters, this city centre aparthotel is inspired by a 1920s ocean liner. With original 1906 features, there are glazed tiles, terrazzo flooring, timber wall-panelling, fireplaces and even the original safes. 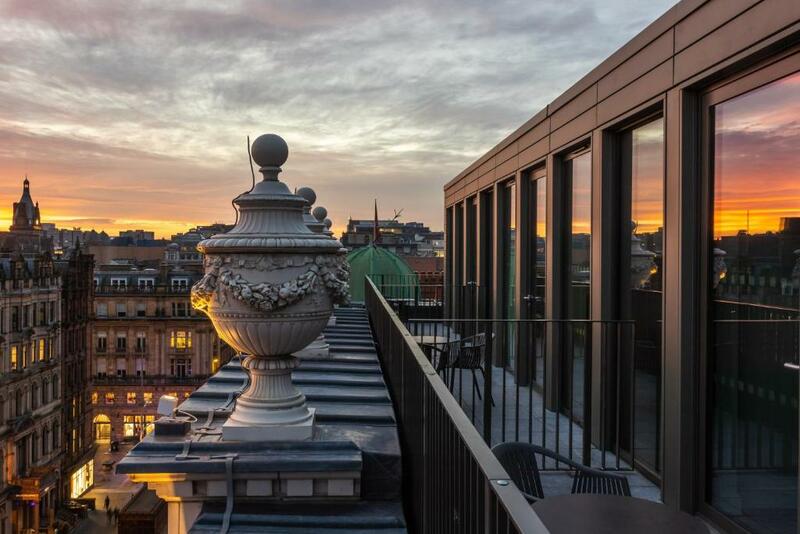 With a 24-hour reception, concierge and on-site breakfast at the Anchor Line restaurant on the ground floor, Native Glasgow is located next to George Square. Featuring a terrace, all units include a seating area, a flat-screen TV, an equipped kitchen, a dining area, and a private bathroom. A dishwasher, a microwave and fridge are also available, as well as a kettle. The on-site restaurant specialises in European cuisine. Citizens' Theatre is 0.7 miles from the aparthotel, while Glasgow Royal Infirmary is 0.8 miles from the property. Native Glasgow has been welcoming Booking.com guests since 6 Sept 2018. 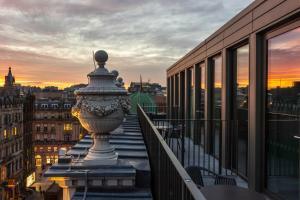 When would you like to stay at Native Glasgow? Found on the top floor in an modern extension to the original building, these apartments have an open-plan layout and are light and bright with a small terrace and views over Glasgow city centre. These premium studios are more spacious than the standard studios. With a rich colour palette, high ceilings and original windows, they features a fully equipped kitchen, stylish shower room and large bed. These apartments have a separate bedroom from the living area and a washing machine. These apartments feature the same fully equipped kitchen and stylish shower room, but with a more spacious living space and larger bedroom. Situated on the 7th floor with a private terrace, this apartment has great views of Glasgow city centre. It features a modern open plan living space and kitchen, a separate bedroom with large double bed and a stylish shower room. While these spacious apartments are still open plan, there are separate areas for sleeping and eating. These smaller studio apartments have original features. With an open plan layout, there is a equipped kitchen, a table and chairs and a shower room. Found in an Edwardian building formerly home to the Anchor Line Shipping Company’s headquarters, this gorgeous city centre aparthotel draws on the opulence of a 1920s ocean liner. With original 1906 features kept intact, you’ll find glazed tiles, terrazzo flooring, timber wall-panelling, stunning fireplaces and even the original safes. The original façade details of nautical emblems, seaweed and shell details on this Art Deco building are not to be missed. 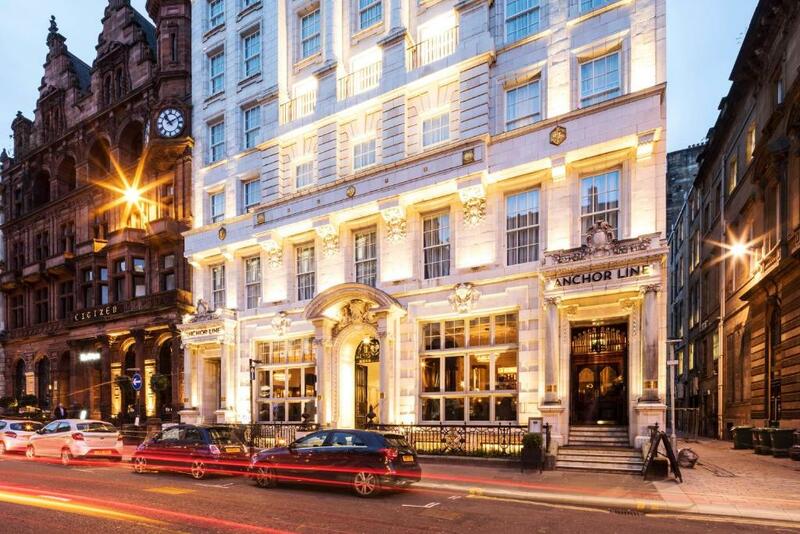 With a 24-hour reception, concierge and on-site breakfast at the Anchor Line restaurant on the ground floor, you’re on the doorstep of George Square and couldn’t be better placed to explore Glasgow and the surrounding areas. House rules Native Glasgow takes special requests - add in the next step! Native Glasgow accepts these cards and reserves the right to temporarily hold an amount prior to arrival. Payment for a non refundable reservation needs to be processed via an online payment link. Guests will receive an email direct from Native labelled, It s time to pay, within minutes of making the reservation. Within this email will be an option to open a secure payment page which is to be used to process payment for the reservation. Guests who have made a refundable booking will also receive this payment request email, however, the payment due date will be their day of arrival, therefore, they are more than welcome to make payment at the property upon check in if they do not wish to pre pay the reservation. Please Note: The housekeeping service is provided on a weekly basis. We do not accept cash payments. We have a strict no party policy. The only thing that I didn’t like is that we had to check out for 10 o’clock. Feel like you’re getting rushed out the door really early mid day seems like a reasonable time. Getting an email after 24 hours telling us plan to leave and we were staying 3 nights ! No biscuits for my cuppa! The crockery provided in the kitchen was dusty. For a room that was of such a high standard I expected Sky to be on the TV as well as I have watched it in cheaper hotels. Housekeeping knocking on at 9:20am asking if we needed more time (check out was 10am) but we mentioned it at checkout and they said they would mention it was unacceptable. The staff on reception were great. Our doona way too heavy requested lighter blanket but staff could not provide any.